LEADING international classification society Bureau Veritas has been chosen to class a series of unique floating dual fuel power generation units. Converted from existing bulk carriers, the powerships are self propelled portable power stations which can run on heavy fuel or gas and which plug into national grids where required. Designed and financed by Turkish energy company Karadeniz Powership Co the vessels are being converted at the Turkish Sedef Yard. 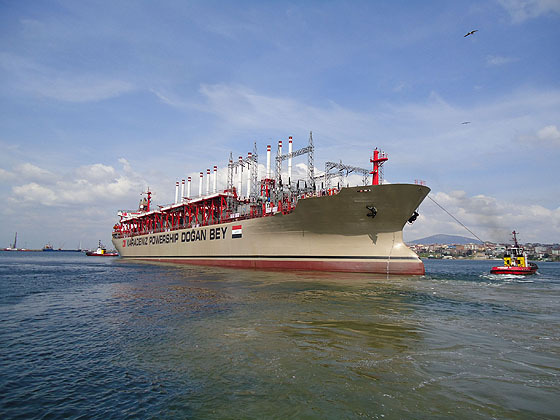 Kerim Kiper, head of Bureau Veritas' Turkish office says, "We have just seen the first of this series of three vessels delivered and it is now in successful service in the Middle East Gulf. Two more powerships based on panamax bulkers are still under construction to our class at Sedef and will be delivered later this year." Each powership is fitted with MAN Diesel dual-fuel engines and generators capable of running on either heavy fuel or natural gas. The first vessel has a 144 MW generation capacity and the two following will be 180 - 220 MW. The BV service notation was assigned as Special Service - Power Plant. "BV's unique experience in overseeing both shipbuilding and power plant development gave us the ability to take on these projects," explains Kiper. "There are large areas of the world where flexible floating power stations can make a huge difference and we expect to see more such vessels built in the future. The experience now gained here in Turkey with Sedef Shipyards with the first units will enable Karadeniz, Sedef and Bureau Veritas to have a head start. This contract shows the capacity and the expertise of the Turkish yards to build ready to go infrastructure for developing nations and to diversify their production range." Bureau Veritas is a leading international service provider, dedicated to quality assurance, environmental, health, and safety, (QEHS) management services across a wide range of economic activities, including marine, industry and facilities, government services, and consumer products. By far the largest classification and certification society, Bureau Veritas has over 39,000 employees and 900 offices in over 140 countries throughout the world.